PhpStorm is a full-featured IDE that has somewhat of a cult following amongst the WordPress developers I follow. Made by JetBrains, it’s notable for being lighter weight than most IDEs, web development specific (though not just PHP as the name implies), and very customizable. They also link to a full tutorial for using it with WordPress that has more great screenshots like the one I show above. The changes are available for preview now in their Early Access Program, and will be baked into Version 8. Those that are familiar with using a full IDE will probably get along just fine with PhpStorm. Those that primarily use text editors like Notepad++ or Sublime Text or Coda may be overwhelmed at first. There are many advantages of using an IDE, but they’ve historically been plagued for being slow and complicated. PhpStorm works hard to not be. If you’re intrigued but love Sublime Text, Jeffrey Way (formerly of Envato) has a tutorial on his membership site called, Make PhpStorm Pretty that you can enable for $9, and he shows you how to make it look very similar to Sublime. That’s pretty cheap to make your every day coding environment better. And a double win if you’re interested in Laravel anyway. I’ve been intrigued by PhpStorm for a long time, but this finally be what encourages me to give it a shot. It took me a while to get into IDE camp, but it was PhpStorm that did it. Somehow that team has changed my bias about IDEs needing to be clunky, obviously “Java” based, slow software because they’ve done something special with the platform. While it is built on Java, it feels so much less so because they’ve dedicated time to the UI, especially in their Darkula theme. I’ve been a PhpStorm user for a couple years now and their updates have been consistent and impressive, but this blew me out of the water. Some time ago I stumbled upon a PhpStorm ticket from Mike Schinkel (one of the dozens he’s been involved with) asking for support for WordPress hooks. I voted for it and watched sporadic votes come in, which was great. All of a sudden the ticket got accepted which was fantastic news, but that’s all I expected to be honest. That’s kind of how my experience with PhpStorm can be summed up: consistent, pleasant surprises. I’m a fan of a great text editor like Sublime, but after being spoiled by PhpStorm I’m fairly sure I’ll remain an IDE guy. Thanks for sharing your experience. That’s even more of a positive nudge for me. I’m definitely going to have to put this on my schedule to spend some time on. 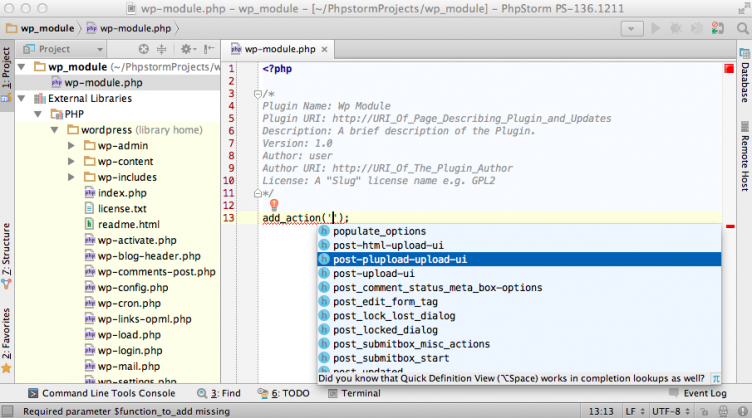 1 – Hows does PHPStorm handle remote development. 95% of my development is done on a remote server, not locally. I know when I tried NetBeans, that was a deal breaker. Has anyone tried PHPStorm with remote development? 2 – How many of these WP features in the new PHPStorm release can be emulated in SublimeText 2/3? Reading through the list of features, I know for sure at least a few can. I have nothing against IDEs and was blown away by Netbeans. But the speed and lack of remote development support has kept me using ST so far. Would love to revisit an IDE through PHPStorm though if it worked well. It depend on your definition or “remote development”. If you mean what I think you mean — actually working on remote files over SSH or otherwise, then no. IDEs need local copy of files because bulk of what makes IDE an IDE depends on it. PhpStorm indexes all of the project, which enables it to perform a lot of nifty search and refactoring easily. This is beyond “code editor” type functionality and doesn’t work with “edit single remote file” model. Thanks, yeah that is what I meant. I figured that was the case since it operates the same as NetBeans. Having a project remotely doesn’t really work because, like you said, all the project files that need to be indexed and what not. Oh well, I’ll stick with ST. Sadly, no WordPress hooks – yet!